Lot Size: 215.93acres n/a "215.93 Acres"
Terrific location, in Avonport, less than a minute from Exit 9 off Hwy # 101. 50 Minutes from downtown Halifax. 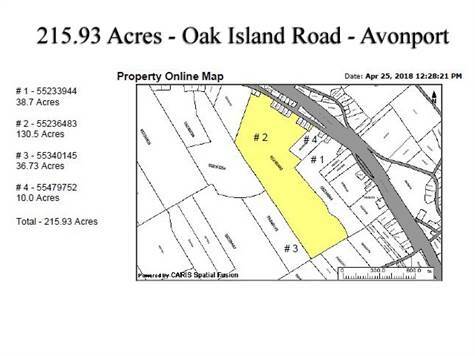 11 potential building lots on Oak Island Road (value of $ 460,000). 13.5 Acres under Development Agreement (until 2026) for up to 72 units ($ 7,750/unit), value of $ 540,000. Remaining 195 +- Acres for future Residential Development and/or Agricultural or other usage (Golf Course, etc.) at $ 4,656.41/acre. Located at the entrance to the rich grape growing Gaspereau Valley. Minas Basin and Blomidon views. Assessment Account #s - 08114528, 08078475, 09426906, 09811389.